You have life insurance, home insurance, etc. to protect yourself against the possible unknown. You’re more likely to lose your data on your computer. Offsite backups from Blue Cactus Pro is like CHEAP insurance – protecting yourself and your business against the unknown disasters that can happen to your data. 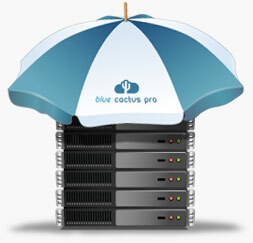 Blue Cactus Pro is a backup application for backing up data on work stations, database servers, email servers, file servers, desktops and notebooks, and more. In addition to all the features of Blue Cactus, here are a few extras you get with Blue Cactus Pro. With Blue Cactus Pro’s on-site and off-site backup capabilities, a crashed Windows system with 10GB in size can be recovered within 10 minutes from the local backup or the off-site backup server. If you have a disaster and need an exact copy of your hard drive before it crashed, we can send one out with our hard drive delivery service. It can also be used to quickly transfer large amounts of data to the backup server. Secure backups are necessary to be PCI compliant. Also, HIPAA requires a data backup plan to “establish and implement procedures to create and maintain retrievable exact copies of electronic protected health information.” Blue Cactus Pro can help with your company’s contingency data backup plan. Blue Cactus Pro supports all leading operating systems which can run Java2 Runtime Environment 1.4.1 or above, including Windows, Mac, NAS devices, etc. It also backs up common database applications, including Microsoft Exchange Server and Microsoft SQL Server.